And he took bread, and when he had given thanks, he broke it and gave it to them, saying, “This is my body, which is given for you. Do this in remembrance of me. Remembrance is the Greek word, anamnesis. Anamnesis does not only mean memory by mental recall, but the fresh experience of a past event by reenactment. This mysterious work of the Holy Spirit brings the evening of the Last Supper forward in order that the people of God may experience the crucified and resurrected Christ afresh. At the Last Supper, the apostles enjoyed all the benefits of the Cross before Christ actually died. Similarly, when we partake of the Body and Blood of Christ, we encounter afresh all benefits of Christ work on the cross after he died: liberty, forgiveness, renewal, healing, etc. These benefits and more are imparted to us at the moment we partake of the Body and Blood of Christ. All that Christ was, all that Christ did, and that Christ is today is communicated afresh to us when we partake of Holy Eucharist. It is highly significant that the only regular ritual act instituted and commanded by Jesus sets forth supremely his death. 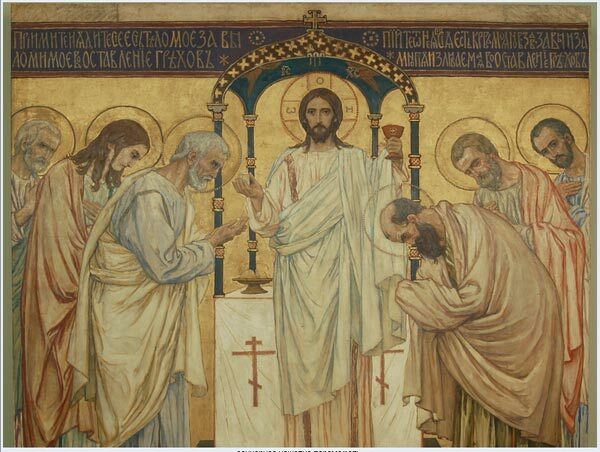 It is his *death*, his body given and blood shed, which the bread and wine were intended to signify. In issuing the command to ‘do this in remembrance’ of him, he intended that his atoning death should be kept before every generation, indeed ‘placarded’ before their very eyes. This according to Paul is the function of preaching. It is one of the functions of communion also. The ministry of both Word and sacrament makes Christ’s death contemporary, presenting it anew not to God (for the sacrifice itself was offered on the cross once for all) but to men (for its benefits are always freshly available). John Stott, Christ the Controversialist (Downers Grove, IL: InterVarsity, 1970), 119. This entry was posted in Holy Eucharist, John Stott and tagged Holy Eucharist, John Stott, Lord's Supper on February 2, 2013 by GlennDavis.